Balmoral Hotel Wedding Video Highlights – Happy Anniversary Victoria & Iain! 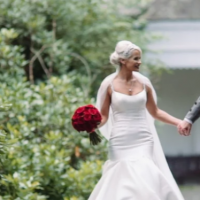 “Love stays with you…and it is beautiful” and it’s plentiful in Victoria & Iain’s Balmoral Hotel Wedding Video. Wow, how time flies, one year ago today Victoria & Iain were married at The Balmoral Hotel, and what a special day it was, for their families..and us! Victoria is the daughter of one of our lovely neighbours and it was a real honour to be asked to film their wedding. I was slightly jealous of Yvonne though as she only had to walk 50m to the house across the street for Bride preps! It also reminded me of why we do this, and what makes it all worth the considerable amount of time and effort we put into the filming and editing of a wedding video. As we were neighbours with Victoria’s parents (Ian & Jill) there was perhaps slightly more than the usual anticipation for the film, and more than a little nerves as we handed over the final proof version of the films a few months later. Then the wait to hear back… The voicemails, the emails, the Facebook messages, and then the knock on the door from Ian & Jill to tell us how happy they all were with the films, encapsulates exactly our motivation for what we do. The comment from Victoria of “We finally have our very own Cherry Tree (Video) and it’s the best I’ve ever seen! !” made us grin from ear to ear for weeks! (and just did again as I wrote this!). 😀 The sense of pride to know that you’ve made someone so happy, and given them a keepsake like this is pretty darned cool. The Wedding day itself was just fabulous, and the day reflected their lives together…ie a ton of fun. So we’re delighted to share with you Victoria & Iain’s Wedding Highlights film, exactly one year on from their wedding and to wish them the most amazing 1st Anniversary (although we know they’ve been celebrating hard all this past weekend… thanks Facebook :p).